Your furry friend will love the Dog Gone Good Barkery Soothing Oatmeal Dog Shampoo! It is truly a wonderful soothing shampoo for your dog's dry, itchy skin. It comes in 2 sizes, 8 and 16 fluid ounce bottles. Oatmeal and aloe are recommended by veterinarians to effectively combat skin irritation, promote healing and re-moisturize dry skin. Oatmeal eases itching and irritation on the skin, so it often serves as a topical treatment for dogs and people suffering from allergies. Saponins in oatmeal are what make it an effective skin cleanser. Starches in oats make them retain water and form a protective barrier on the skin, which helps relieve dryness. Phenols provide anti-inflammatory effects, which also helps relieve your dog's itching. 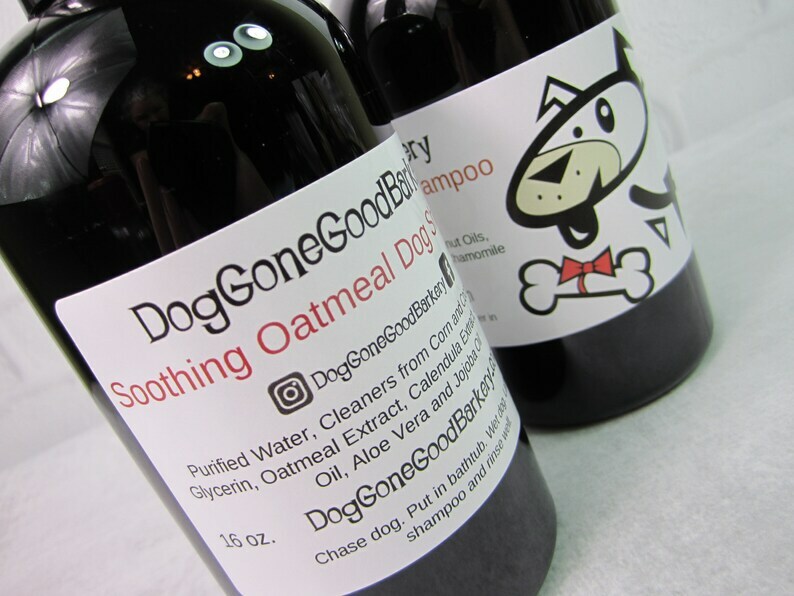 *Dog Gone Good Barkery Soothing Oatmeal Dog Shampoo contains no sulfates, DEA, MEA, TEA or parabens. Contains no detergents, dyes, alcohol or synthetic colors or fragrances. *Dog Gone Good Barkery Shampoos are formulated with a blend of coconut and corn oils which leaves your dog's coat naturally clean and refreshed. *Contains only natural ingredients that soothe, moisturize and sanitize skin relieving irritation and itching associated with insect bites. It also nourishes dog's coat to be thicker, shinier and healthier looking. Chase your Dog Gone Dirty Dog and put him in the tub. Whew! The hard part is done! Wet your furry friend with warm water, shake the bottle and lather in the shampoo. Make sure to keep out of his eyes. Rinse well. After he shakes all the water off all over your floor, brush and give him some lovin' and a treat from Dog Gone Good Barkery!